Last month I spent much time while configuring tinymce’s spellchecker with my rails application. But finally I got it working and thought I could be a good post. To configure this I took some help form gusto’s blog and google (as usual). So, Lets do it now without spending more time. Now consider that I have a Users controller and User model with a text field ‘about_me’, and I want to use tinymce with spellchecker for that field. **Please cross check that you have added(enabled) ‘spellchecker’ in :plugins and added spellchecker button(I have added it in :theme_advanced_buttons2). 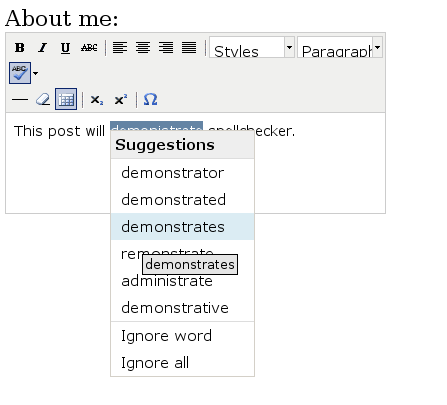 Now if you go to new user form you will see that about_me text area is replaced by tinymce editor with spellchecker button. Now download Spelling.rb, save it as spelling.rb in your rails lib dir and change ASPELL_PATH at line 7 according to your aspell installation. Once it is done include this module(“include Spelling”) in application.rb or you controlller (here in our case users controller). 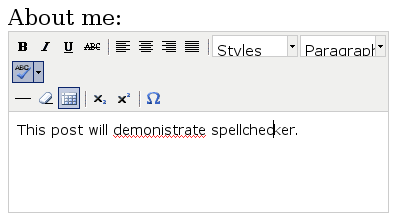 Now, Type some thing in tinymce editor and click on spellchecker button. It will highlight misspelled words. And when you click on highlighted misspelled word it will show suggessions. This code is now included in the latest version of tiny_mce plugin. Thanks for this. It worked really well for me when I added it to my current tinyMCE configuration. you shouldn’t use spelling.rb, as it will open your site to hacking (very easily).